A checkers table cloth in white and red is the perfect item to start with at your 4th of July. On top of it add a cute cookie tray filled with a themed desert such as cupcakes or stars shaped cookies. Moreover, add blue, white and red fireworks and other deco items that go with this chromatic such as a bunch of red flowers. If you want a very fancy 4th of July table setting, pick China plates with a creative print in blue or red. Add also a cool glass or bottle instead or a vase and fill it with summer flowers in the American chromatic. Don’t forget to decorate your table setting with flags and a matching table cloth. 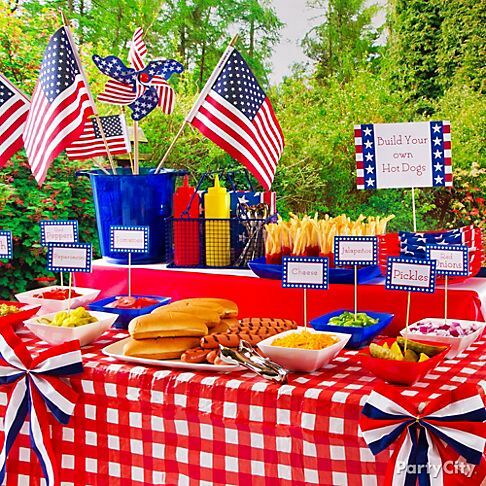 Don’t forget to decorate your table setting with flags and a matching PVC tablecloth from Simply Tablecloths. If you want a very original table setting pick a DYU table cloth with stars, here is how you can make it. It’s really easy! Decorate it with matching napkins, glasses and a cool lantern that will give the space a cozy and homy vibe. If you have a big gust list, make a cool themed buffet. First of all, pick a big table cloth with the American flag print and decorate it with lots of vases with fresh flowers in white blue and red. Then, add cute cupcakes with small American flags and other themes and delicious deserts. 5. Fast food? Yes, please! Who doesn’t love some delicious fast food such as hot dogs? Make a themed table at your party using red, blue and white decorations such as a table cloth, glasses and plates. To make the space more creative add cute card notes to each of type of food you serve. Don’t forget to add ribbons, flags and other cool party decorations for your guests. Cute ideas! My mom was great at July 4 styling, collecting so many things over the years.